Backroad Vagrants » Overland Travel Guide » Trip Planning » Overlanding costs analyzed: A full break down! 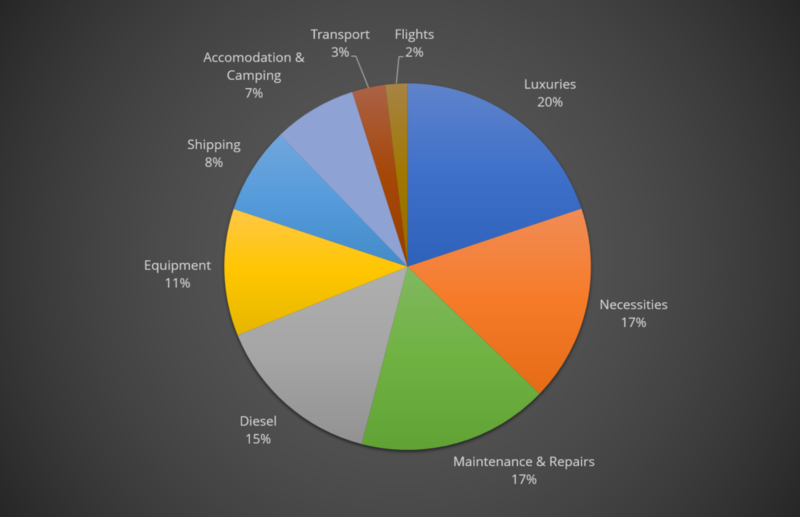 Overlanding costs analyzed: A full break down! One of the fundamental questions during your overland journey planning stages is budget. It all comes down to money and time, in the end! Overlanding costs depend on a bunch of factors. While you can certainly influence your route, amount of driving or how often you spend money on a hotel room or a fancy dinner, there is also quite a bit of luck involved. An expensive repair on your vehicle can set you back by a couple of thousand euros in no-time. We cannot tell you how much your journey is going to cost you, but we will make your budgeting easier by giving you an insight into what we have spent so far. For that purpose, we have not only taken track of all our trip expenses, we have also attributed them to different categories. In this upcoming post series, we will shine a light on the question ‘how much does overlanding cost?’. This post should give you an idea of the overall costs involved. Later on, we are going to analyze the cost of overlanding in the different countries we have visited. Over the course of the past two years, we have spent a daily average of 65.22 €. This covers all our expenses. Now lets shine some light on the categories we have used! Although, with 20%, the biggest chunk in our break down, it only includes a very small amount of jewelry. This category contains the occasional visit of a bar or restaurant, gifts and souvenirs and what we call ‘entertainment’. The latter ranges from entrance fees for national parks or concerts over visits to sports matches to scuba dives or white water rafting. All that stuff that is fun but not crucial to survive on the road. How often we eat out depends on the local cuisine and price range. In expensive countries, we limit ourselves to once every fortnight. In India, where restaurants are cheap and the food is super delicious, we ate out almost every day (and we never got sick)! The same holds for entertainment. We do not do the expensive stuff often. On the other hand, we do not walk past a world class reef without taking a dip in the water. And we also like to have a drink in a decent bar from time to time. These 17% of our expenses are really boring! Groceries, fees and taxes (for visa, insurance etc. ), communication (SIM cards and data/calls) and basic needs like paid showers or drinking water taps. We had two major repairs of the car in Australia. Without them, this category would drop from 17% to only 8% of our total expenses! This one should be self explanatory. Save money by driving less! Items in this category are, for example, shoes, clothing, tools, maps, an additional solar panel or new phones. Stuff breaks along the way. There is nothing you can do about that. We still try to fix everything broken rather than buy new immediately. However, try to go on some small trips before leaving for a big one. That way, you can avoid the hassle, sourcing things on your way. This includes the passages from Vladivostok to Melbourne and from Melbourne to Tasmania and back. Expenses we try to avoid, which is not always easy. Especially in populated areas. In cities, hostels are also great to stay and have a shower and some social interaction. We take the bus in cities! We only flew from Vladivostok to Vietnam and from Vietnam to Melbourne. Therefore, flights only make up for 2% of our costs. It’s an overland journey, after all! Now you know where our money went! Keep your eyes open for our upcoming posts on the cost of overlanding in individual countries! For further questions or remarks, feel free to leave a comment! Interesting. These are ours: http://www.deeindervoorbij.nl/money.html; not too different. Interesting to see! Thanks for the link!